Not! If you have spearmint growing in your garden, one of Annie’s favorite herbs, there are countless uses for this sprawling growie. 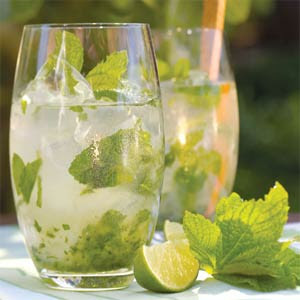 One in particular perfect for this summer heat is the popular refreshing drink, the Mojito. http://en.wikipedia.org/wiki/Mojito Considered the Cuban highball, you could try making this less the rum to keep it kid, driver and heat friendly. Everyone knows that alcohol is not a good thing in this excessively hot weather. It just turns up your thermometer gage and who needs more degrees, at least those kind when it’s already 100 +. In our garden, I’m never short on spearmint. So spare me the spearmint? Never! Anyone can grow this herb - no excuses. Mine came from my grandmother’s garden so its flavor is tons better than those cultivated ones but still give this herb a try. There are loads of ways to get creative with spearmint. Adding it to home-brewed iced teas gives it a settling flavor. I’m always chopping up spearmint and garnishing egg, potato, macaroni salad…anything that you want to boost with some spearmint personality. And when the weather turns a bit better for drying herbs, this is a must for a winter stash of minty flavor. But who is thinking winter right now? A blast of cold air could be rejuvenating. With that thought, we’ll end with a Jane Austen quote to appreciate this sultry summer heat. “To sit in the shade on a fine day and look upon verdure is the most perfect refreshment.” Add a nice minty drink and you should be able to make it past this heat wave. P.S. Here’s a Mojito recipe with watermelon (Yum – that thirst-quenching summer fruit) from Ina. http://www.foodnetwork.com/recipes/ina-garten/watermelon-mojitos-recipe/index.html Happy Friday!